If you've ever been enticed to buy a type of produce purely based on an intriguing name (just me?) and then been disappointed when there is seemingly no connection at all (I’m looking at you, Jerusalem artichoke), you’ll appreciate yard-long beans. This is because they do, in fact, live up to their name. Well, sort of. Sometimes. 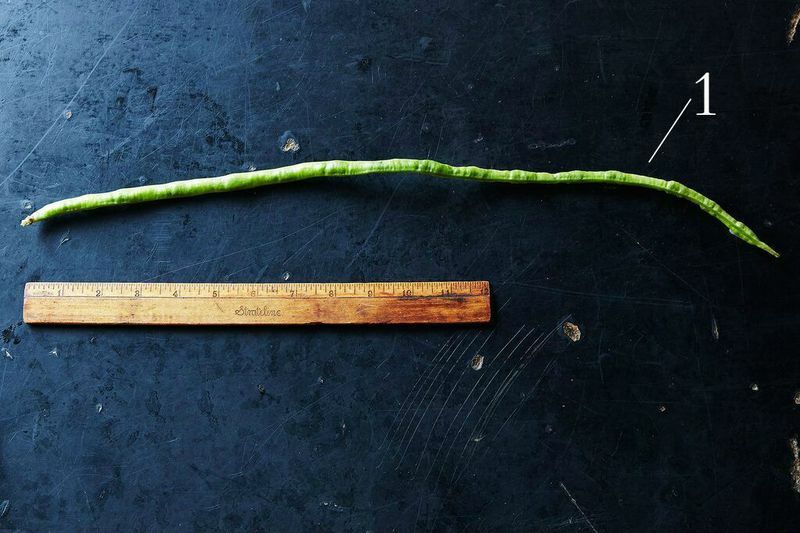 Yard-long beans can, in fact, grow up to a yard in length, but while a few varieties are indeed their best at greater lengths, most types of yard-long beans should be picked when they’re shorter. So their scientific name—Vigna unguiculata subsp. sesquipedalis—actually gives the best indicator of their length: "Sesquipedalis" means “foot and a half,” and many varieties are indeed around 18 inches (1, below). 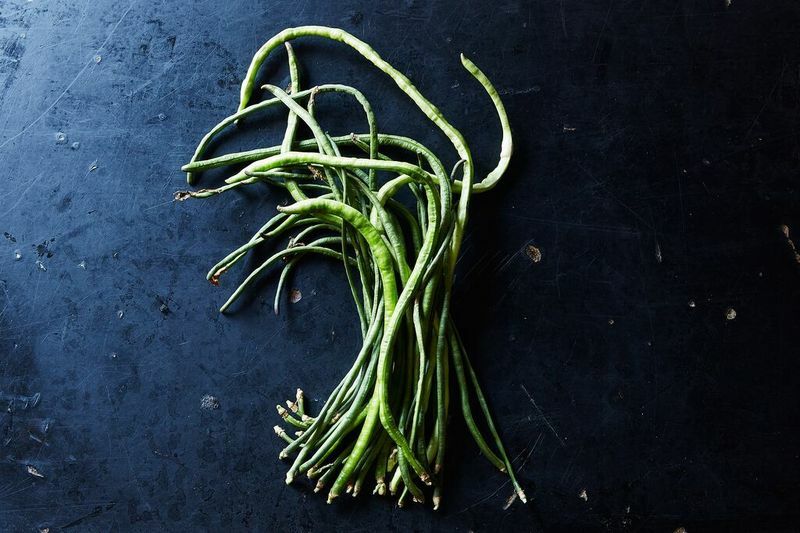 Yard-long beans might look like overgrown green beans and they are both members of the legume family, but yard-long beans actually belong to different genera: They're part of a subspecies of cowpeas (which are also known as "field peas" or "Southern peas"). With most types of cowpeas, the hulled peas are consumed, but with yard-long beans, it’s more common to eat the immature green pod, just like green beans. They are normally sold in bundles; if you can’t find them at your farmers market, try an Asian market. Choose thin beans free from bulging (which would indicate that the peas inside are too developed) and don’t be concerned with floppiness and wrinkles (2, below). Use your yard-long beans within a few days—they can quickly go from floppy to limp. Though yardlong beans taste similar to green beans, their texture is distinct. Unlike green beans, which can taste palatable steamed or boiled, yard-long beans become waterlogged and bland when treated with water. The beans are best cooked with oil: sautéed, stir-fried, or deep-fried, their flavor intensifies and their texture remains tight and juicy. As such, these beans aren't exactly the diet vegetable of the summer, but they are extremely good to eat and their texture makes them worth seeking out. Steam them and serve them over fried rice. Put them in a sandwich—really! Add to your next stir-fry. Chop them up finely and add them to your next batch of mashed potato cakes or vegetable fritters. Throw them on the grill—you know you wanted to fire it up one last time. 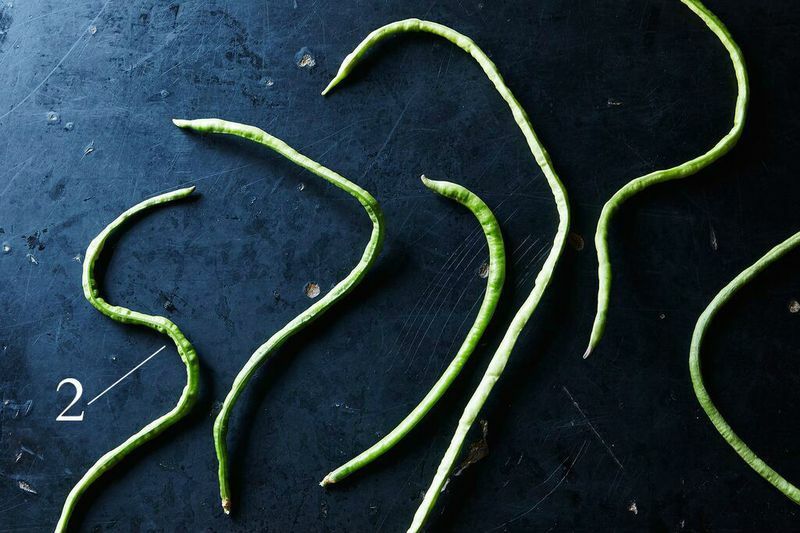 Tell us: What are your favorite way to use yardlong beans? I've seen these in Indian markets, tied into circles. Once, I bought them out of curiosity and used them as regular green beans-snipped down to size-in a pan with some oil, s&p and sliced almonds. I was totally guessing, so I'm glad I treated them right(ish)! Very glad that these are available in the local Meijer hypermarket. They always taste great when you order them Sichuan-style in Chinese restaurants. I stir fry them with coconut and a tempering of mustard, curry leaves and arbol chiles. If you find a couple of the 'bulging' developed pods in your stash, just go ahead, peel the bean open, remove the bean out and eat them as is, they're like tender peas.